Mike Brooks, Mr. Inside Sales receives multiple awards from AA-ISP’s 2018 Leadership Summit last week: Service Provider of the Year Award – Sales Script Development AND The TOP 25 Most Influential Inside Sales Professionals in 2018 Award. Raleigh, NC, April 9, 2018 — MrInsideSales.com announced today that the AA-ISP recognized Mike Brooks as part of the AA-ISP Leadership Summit 2018 at an awards gala held on April 4th at the Sheraton Grand in Downtown Chicago, Ill.
Mike’s company, Mr. Inside Sales, is hired by business owners to develop and implement proven sales processes that help them immediately scale and grow Multi-Million Dollar Inside Sales Teams. He also offers customized sales training programs, works as a virtual V.P. of Sales and presents at sales conferences, delivering keynotes and break-out sessions around the world. “It is an honor to recognize Mike Brooks, Mr. Inside Sales, as this year’s recipient of the 2018 Service Provider of the Year Award for Sales Script Development. Mike has consistently proven his dedication to helping advance the professionalism and performance of the inside sales industry, which is the mission of the AA-ISP,” said Bob Perkins, Founder and Chairman. “We applaud Mike and thank his company, Mr. Inside Sales, for their service to our growing profession and community of inside sales representatives, leaders and solution providers,” stated Perkins. In addition, Mike Brooks was also named as this year’s recipient of The TOP 25 Most Influential Inside Sales Professional Awards. “Mike Brooks has proven his dedication and commitment to advancing the profession of inside sales, which is the mission of the AA-ISP,” said Bob Perkins, Founder. “We are confident that Mike will continue to have an impact on the inside sales community for years to come”, stated Perkins. Mike Brooks, Mr. Inside Sales, is a master phone script writer and author of the new bestselling book on phone scripts: Power Phone Scripts: 500 Questions, Phrases, and Word-for-Word Scripts to Open and Close More Sales. Mike is THE recognized authority on inside sales training and phone script development, and his company, Mr. Inside Sales, was awarded the 2017 Service Provider Designation for training and development by the American Association of Inside Sales Professions last year as well. For more information on AA-ISP, please visit www.aa-isp.org or follow the company on Twitter @AA_ISP. No theory with Mike…he did it himself and is continuing to do it. Everything he’s learned is transferrable and understandable. Mike is consistently the best- best ideas that work! Great insight and the simplicity of his techniques are so easy to implement. Consistent, quality information and tips for inside sales people, and as a marketer, I also use the tips to help me “sell” as well. Love his insight, lessons and I always learn something. Mike provides clear responses to objections, blow-offs etc. that help a salesperson to have a back-up plan and continue the discussion. His techniques and information is the best! Very informative with tremendous insights into teaching urgency and the creation of value statements. Mike provides very practical solutions to what can be an intimidating process. His scripts give you first-hand ways to make yourself more productive. Outstanding insights into structuring outbound outreach that works. His content and scripts are amazing – the cornerstone of my inside sales process. He’s given so much real USE info. He’s sharing everything that can help people; so much more than GENERAL theories that aren’t duplicatable. His stuff is immediately actionable! As one of the most direct, down to earth, sales trainer out there. His content, books and training really deliver ready to use knowledge with no time wasted. His dedication to share the knowledge and skills that have helped him elevate himself from a low income salesperson to one of the top sales people in his career. Mike consistently provides the highest quality sales information that is easy to understand and apply. Mike is good at bringing out the salesman in everyone. He provides incredible content. His script framework and content surrounding the habits that lead to success are superb. I feel that the information and techniques found in Mikes books and the personal attention he gives his clients make him a top candidate for this award. He has helped me and my team tremendously. The scripts and the grading techniques he taught us has made our firm much more competitive in our market. Mike has great pointers and scripts on handling cold-calling and prospecting that I’ve found to be very helpful! Mike is extremely knowledgeable and experienced in sales. He has they awesome little tips and ways of looking at things that end up making a huge difference in how you approach sales. I’ve been reading all of his stuff for a few years now and recently did sales coaching sessions with him. He has greatly enhanced my ability and comfort with sales. I highly recommend him for this award! He deserves it! Mike provides many on-line training sessions regarding sales. He is very knowledgeable of sales and offers tips on how to improve. Very easy to use useful suggestions. Definitely has a thorough understanding of the sales process. Mike’s scripts are very effective. We use them in many of our marketing and sales efforts. His blog and website are very content rich. The tips included in his blog are consistently effective. Mike has done nothing but make our company money with his open, honest and motivating information. I honestly cannot imagine how we would be training new employees, or for that matter, re-training old ones without his help. There is no substitute for what he has to offer. Over the years, I have found Mike Brooks’ Mr. Inside Sales information on track, relevant, and motivating. I can’t say that about any other Inside Sales pros out there today. Presentations and books are invaluable tools in the growth of my business. In our start-up the teachings from Mr. Brooks have really been a life-saver. I’ve been in sales setting up appointments for our professionals for 30 years, and his book Power Phone Scripts has opened my eyes to a right-on approach. Freely shares his sales wisdom and truly is a great surrogate mentor to me over the years. The information Mike shares is top-notch. 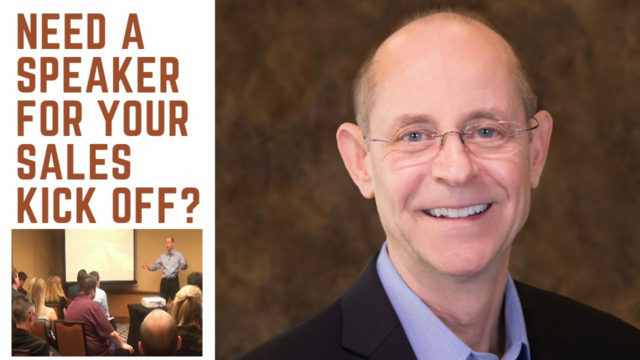 Mike does an amazing job at clearly sharing his expertise to help my team and I do a better job with our clients – especially qualifying prospects so we can spend more time with folks who want to buy. Tuesday is one of my favorites days of the week as I look forward to Mike’s weekly sales column. Mike is very generous with his knowledge. He offers real, tested advise that works. He is pleasant to work with and knowledgeable and very helpful! Always great articles, tremendous insight into the inside sales world and I learn something every time I read it. I’ve bought Mike’s books and gained useable and productive work tips. Great author, leader, mentor, and most importantly, an excellent salesperson with quantified results. He is tops at what he does and helped our team so much! I have been listening to his recordings and have been subscribed to his weekly ezines for 3 years and I have found his information to be very, very helpful. He provides a lot of valuable tips and information at no charge and without pushing other products. He really helped me a lot with his information in qualifying prospects, plus some new insights in general sales techniques. He study under Stan Billue and then became a master himself helping others conquer Inside Sales. Thank You to My Readers: MIS Wins 2018 Service Provider Award! I’d like to take a quick moment to acknowledge all my readers and clients who nominated MIS in two categories this year. At the Summit in Chicago last week, a brand new category was created just to acknowledge my commitment and contribution to inside sales. 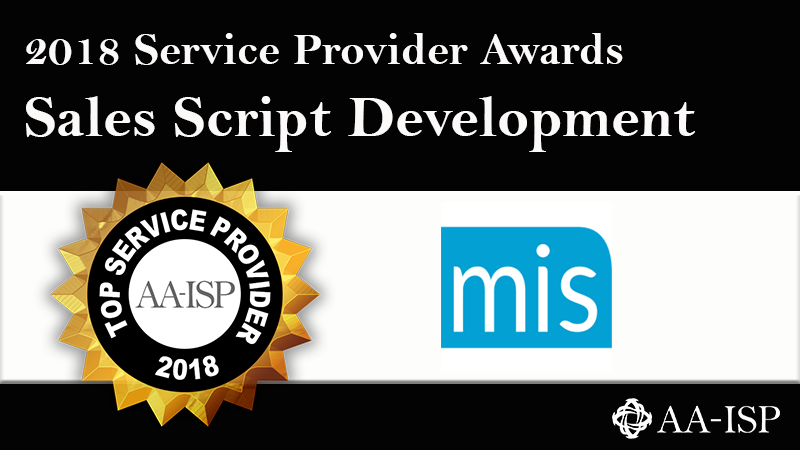 MIS was awarded the “2018 Service Provider of the Year Award” in the category of Sales Script Development! Now that was unexpected, and I’m deeply humbled by it. In addition, I was named one of the “Top 25 Most Influential Inside Sales Professionals”—for the eighth year in a row! Don’t say that, say this! You can access your free sample with all these scripts here. Thank you again for all your support. I look forward to continuing to create great content, and word-for-word scripts that you can use every day to become more successful selling over the phone. I’m going to be presenting both sessions centered on the importance of having and using best practice scripts (one B2B and one B2C session). What I find interesting is the mixed reaction I still get when I speak to some sales leaders about the use of scripts. Some obviously get the importance of having a standardized, best practice approach set of scripts to train and measure their reps against, while some others don’t think their reps should use a script. They think they’ll sound too much like a telemarketer or that their sale is too “consultative” for them to follow a script. Here’s what I tell them: First, all your reps are already using a script. If you don’t believe me, then just record them for a week, transcribe what they’re saying, and then what will you have? You’ll have a script of what they say, day in and day out! But, I tell them, you’ll also have ten or fifteen different versions of what should be a best practice “story” you’re telling about your company, product, and service. This is because most sales reps are winging it and ad-libbing their way through their sales presentations. And that is why they are struggling and not consistently making their revenue numbers. The solution to this is straight forward: Take the message your top producers are delivering, combine that with a standardized “best practice” approach, script it out, and then have your team use that scripting until they have internalized it and are consistently delivering your best messaging. Once I explain it that way, they suddenly realize what I mean when I tell them they are all wrong about phone scripts. You’ll make more sales and actually look forward to coming to work! And many, many other benefits. Bottom line: I’ve been training inside sales reps for over 30 years, and I know what works and what doesn’t. Scripts work – ad-libbing doesn’t. It’s that simple. If you would like to know more, then book a flight to Chicago and join me next week. It would be good to see you! Are you going to the AA-ISP’s Leadership Summit in April? (Chicago, IL). If so, let me know — I’d love to meet you! Also, if you haven’t purchased a ticket yet, reach out to me and I’ll give you and your team members a discount coupon to save $200! Looking forward to meeting some of you there.